That was a busy old three hours or so, wasn't it? A winning Harlequins return for England skipper Chris Robshaw, Saracens continue their 100% start and Gloucester edge the M5 derby. Over at Rugby HQ the World Cup final has just begun - and you can follow live text and radio commentary by clicking here. We'll see you there! Gloucester recorded their second win of the season with a narrow victory over local rivals Worcester at Kingsholm. The Cherry and Whites led 19-17 at half-time, with Richard Hibbard and Sione Kalamafoni crossed for the hosts and Cooper Vuna and Niall Annett touched down for Warriors. Vuna grabbed his second try after the break, but Tevita Halaifonua scored to restore his side's lead with 20 minutes left. Dean Ryan's side huffed and puffed but could not overcome the two-point deficit. Harlequins produced a stunning second-half performance to defeat Bath at the Recreation Ground. Quins, who had England captain Chris Robshaw back in their side for the first time since the World Cup, trailed 13-12 at the break after Kyle Eastmond's try. But fly-half Nick Evans kicked eight penalties, while Danny Care and Dave Ward each scored tries, as the visitors ran riot in the second half. Late scores from Nick Auterac and Semesa Rokoduguni made the scoreline look closer than it was. Gloucester are eventually awarded a penalty from the scrum. James Hook kicks to touch and that's time. The Cherry and Whites edge what was a gripping match. A sudden break from Worcester and they enter the Gloucester 22. However, their hopes of scoring a late winning try are dashed by a forward pass. Worcester feel the cost of all those scrum penalties as prop Nick Schonert is shown a yellow card. The Warriors have used all their forward replacements so we go to uncontested scrums. Gloucester kick for touch but Worcester steal the line-out and clear the pressure. Two more penalties for Gloucester from this series of five-metre scrums. Gloucester get a penalty from the first scrum but decide for another scrum. Worcester infringe a second time, wheeling the scrum. Cherry and Whites lock Donncha O'Callaghan is furious and calling for further action from the referee. Chris Pennell is forced back over his try-line and Gloucester have a scrum five metres out. The home side are looking to turn the screw and tension is mounting at Kingsholm with less than 10 minutes left. Jonny May thinks he has crossed in the corner to score Gloucester's fourth try of the afternoon, but referee Craig Maxwell-Keys blows up for a forward pass. The replays are shown on the big screen, and they aren't conclusive. The Kingsholm crowd are not impressed. And that's the last action of the game as Quins produce a stunning second-half performance to stun last season Premiership runners-up. There is late consolation for Bath as Semesa Rokoduguni finishes well in the corner but it has no impact on the game. George Ford kicks the conversion. It's a late flurry from Bath as Leroy Houston thinks he's finished off a stunning burst from Semesa Rokoduguni. However, the TMO rules it a 'No Try'. Gloucester hit back and the pendulum swings again, this time back in favour of the home side. After great work from Willi Heinz and Charlie Sharples, David Halaifona races away and finishes in the corner. James Hook can't convert from out wide and the Cherry and Whites have a two point lead with 20 minutes remaining at Kingsholm. Bath have something cheer about as a driving maul sees Nick Auterac bundle over. George Ford hits the upright with the conversion with three minutes remaining. It's 26-3 to Quins in this second half. One heck of a performance from the visitors. It's becoming a rout at The Rec as Dave Ward scores Quins' second try of the game after a decent offload from Tim Visser sets him free. Evans does what he's done all afternoon and kicks the extras. Bath's Kyle Eastmond is sent to the bin for tackling without the use of his arms. There's a bit of a coming together with Marland Yarde also and the Bath man will leave the field for 10 minutes. Worcester work a great move from a line-out. Chris Pennell makes a break and the support comes from Cooper Vuna, who crosses in the corner from 15 metres out. Ryan Lamb, on for Tom Heathcote, can't add the extras. Tim Visser goes over in the corner for Quins but after consulting the TMO a forward pass is called and Bath survive. Gloucester go through the phases in the Worcester 22 and get up to within three metres of the try-line. Billy Twelvetrees' kick over the top doesn't find a Cherry and White shirt and the Warriors touch down in their own in-goal area and get a 22-metre drop-out. Nick Evans is having quite some afternoon for Harlequins with yet another penalty. He's contributed 26 of Quins' 31 points at The Rec. Gloucester start the second half at Kingsholm. Bath have a penalty in front of the posts but decide to go for the sticks rather than kick to the corner and Ford gets their first points of the half. The full-time whistle sounds at Allianz Park, and Saracens continue their 100% start to the season with a 24-14 victory over London Irish. With 14 minutes of the second half gone the scoreboard does not make pleasant reading for Bath fans with their side now 15 points behind after yet another Evans penalty. And that, you'd have thought, definitely will be that. Shane Geraghty drags a kick wide to leave Saracens 10 points ahead inside the final 60 seconds - in the process wasting an opportunity to grab a losing bonus point for his team. Wales international Rhys Priestland is on for his home debut, replacing Ollie Devoto as Bath look to get back in this game. That may well prove to be terminal for London Irish, who concede a penalty at the breakdown, from which Owen Farrell lands another three points to put Saracens clear. Five metres left at Allianz Park. Gloucester have a narrow lead at the break in a cracking encounter against Worcester at Kingsholm. The two sides traded early tries and the lead has switched between the home side and the Warriors several times. Quins with their tails up and after winning yet another penalty in range of Bath's posts Evans kicks them into a 12-point lead against last season's Premiership runners-up. Gloucester get another penalty, this time six metres into the Worcester half.near the touchline. But Twelvetrees' effort hits the right hand upright and the visitors manage to hack the ball away to touch. Danny Care produces a bit of individual brilliance as he breaks from his own 22, finds a gap, kicks forward and after Leroy Houston misjudged it the England scrum-half collected to cross for Quins. The reliable boot of Nick Evans sends over the conversion. Gloucester get a penalty from a scrum right in front of the posts and five metres out. It's a simple kick for Billy Twelvetrees and he makes no mistake. Five minutes to go until half-time. But as is so often the case, the team who've just scored concede a penalty straight from the restart - and Owen Farrell splits the posts to open up a seven-point gap. Bath are penalised for not releasing and Nick Evans puts Quins back in front at The Rec. What have we got here then? It had looked like Saracens may well coast to victory after Alex Goode's try - but London Irish have other ideas. Leo Halavatau scores it, Shane Geraghty converts it an only four points separate the sides with 15 minutes left. We're back under way at The Rec as Quins fly-half Nick Evans gets the second half started. Worcester start a rolling maul from a line-out, and most of the backs get involved as well to push over the Gloucester line. Prop Niall Annett is the man who touches down and Tom Heathcote converts to put the Warriors back in front. Having trailed at half-time, Saracens are now more than a score clear of their visitors. Full-back Alex Goode is the man with the try, stepping past the tackler and touching down from close range. Owen Farrell converts, Sarries are in charge. Ryan Mills hits back straight away to get Worcester back within touching distance. Billy Twelvetrees extends the home side's lead after Worcester were penalised. Saracens, whose lead is still a slender one, bring some of their big guns on from the bench - including England duo Richard Wigglesworth and Brad Barritt. It's Bath who go into the break with their noses in front. After a scrappy start it's growing into an intriguing contest at The Rec. The lead is going back and forth here at The Rec and George Ford takes the opportunity to send over his second penalty of the game on the stroke of half-time. Sione Kalamafoni thinks he has got Gloucester's second try of the afternoon in the corner but the decision is referred to the television match official. After a bit of deliberation referee Craig Maxwell-Keys decides there is no infringement and awards the score. Twelvetrees slices the conversion wide. He's had a mixed start to the afternoon. And at long, long last Saracens have their try! Jackson Wray crosses after a catch-and-drive from the home pack to put his side ahead. Owen Farrell misses the conversion, but that will still be a huge relief to Mark McCall. Bath are penalised for not staying on their feet and Quins have their second penalty in as many minutes and Nick Evans sends over his fourth of the half. Asaeli Tikoirotuma, London Irish's try-scorer, will have to spend the next 10 minutes in the bin for a high attack. Gloucester have a period of sustained pressure in the Warriors 22 and eventually force a penalty from a scrum, six metres in from touch. Cherry and Whites skipper Billy Twelvetrees slots it through the posts, making amends for that early missed conversion. Harlequins come roaring back and Nick Evans sends over his third penalty of the game from in front of the posts. Persistence eventually pays off as Kyle Eastmond goes over in the right corner after Ollie Devoto's pass sets his fellow Bath centre free. George Ford sends over a fine conversion from the touchline to extend the lead to three points. Saracens have been knocking hard on the London Irish door in the early stages of this second half and they at last have some points to show for it, courtesy of the boot of Owen Farrell. We have a one-point game in north London. Bath in the ascendancy but they can't find any holes in this Quins defence with 10 minutes until half-time. Worcester hit back immediately through Cooper Vuna. What a start! The Warriors wing intercepts a pass about 15 metres out and touches down under the posts. Gloucester get a rolling maul going from a line-out and Richard Hibbard gets the decisive touch to give the hosts the first try of the game with just three minutes on the clock. Chris Noakes gets the second half at Allianz Park under way. Can London Irish pull something a bit special off with 40 minutes to go? And we're under way in the afternoon's third Premiership encounter. The weather is perfect at Kingsholm as Worcester's Tom Heathcote kicks off to get the M5 derby started. A quick reminder, with the last of our three games today set to get going in a few moments, that you can listen to live BBC local radio commentary by selecting the 'Live Coverage' tab at the top of this page. Niko Matawalu sends Bath full-back Anthony Watson over but play is called back for a forward pass. The hosts are getting closer and closer. Neither side have got into any sort of rhythm at The Rec, with Bath scrum-half Niko Matawalu doing his best to spark his side into life as David Wilson knocks on just shy of the try-line. Worcester Warriors hand a full debut to Fiji international lock Tevita Cavubati as director of rugby Dean Ryan makes one change to the side which suffered a 27-13 defeat at Sale last time out. Darren Barry drops to the bench for the Premiership newcomers. It's fair to say the scrum has been a bit of a mess at The Rec and after several resets David Wilson is eventually penalised for incorrect binding. Nick Evans sends over the kick as Quins retake the lead. Wales international flanker Ross Moriarty returns from World Cup duty for Gloucester at Kingsholm. He is the only change to the starting XV that lost 17-15 to champions Saracens in round two. How about this for a half-time scoreline then? Champions Saracens trail at the break. From the resulting line-out and maul Harlequins number eight Nick Easter is penalised for coming in at the side but this time Ford goes for the posts and levels the game. But that's tremendous work from the Exiles pack, who hold firm on their own try-line under the full force of another Saracens rolling maul. Quins are penalised for not releasing and George Ford kicks for the corner. Bath are on the attack. Only a couple of minutes to go until the break, and Saracens are deep inside London Irish territory once more. They have a rolling maul moving in the right direction, up to the 10-metre line, but again the Exiles are penalised. Nick Evans gets the first points of the game for Harlequins after David Wilson was penalised for ruck infringement. Saracens win another penalty within kicking range - but Owen Farrell this time turns the opportunity down in favour of heading for touch. However, having secured safe ball at the line-out, the hosts knock on and the Exiles are reprieved. Frustration is mounting. It's a glorious day at sun-drenched Recreation Ground as fly-half George Ford lofts the ball high and gets proceedings under way in Bath. Goodness me, where did that come from? Saracens have spent the majority of this half camped inside London Irish territory - but Asaeli Tikoirotuma adds the finishing touch to a rare Exiles attack to put his side ahead. Chris Noakes converts and Tom Coventry's men take a surprise lead. 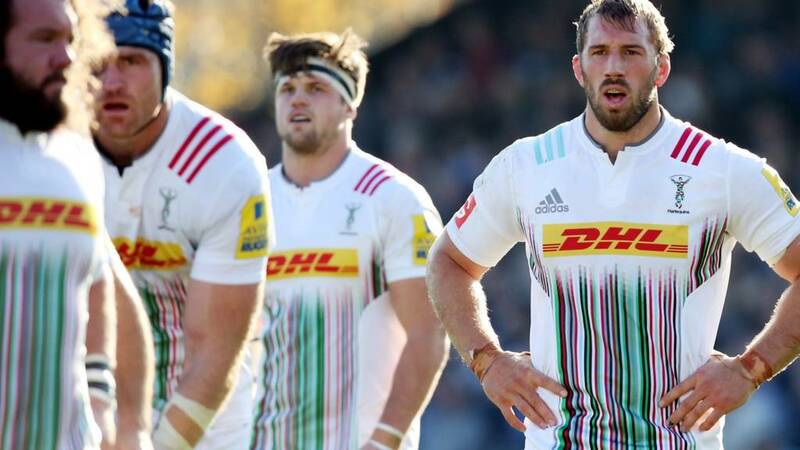 England captain Chris Robshaw makes his first appearances of the season for Harlequins following the national side's pool-stage exit from the World Cup. Winger Tim Visser makes his debut for Quins as Nick Easter, Joe Gray, Joe Marler and club captain Danny Care are given their first starts of the campaign. Indiscipline should be costing the Exiles dearly, as they this time infringe at the breakdown, but Owen Farrell again drags his attempted kick wide. The England man's radar unusually wonky. The Sarries pack has been absolutely dominant so far here, and again they win a penalty at the scrum. This kick is a little further out for Owen Farrell, around 45 metres from the posts, and the fly-half drifts it just wide. The score remains 3-0 after 18 minutes. Bath make six changes to the side beaten at 16-9 Wasps last weekend. Matt Banahan returns to the left wing as Anthony Watson shifts to full-back. Max Lahiff, Rob Webber and David Wilson form a new front row, and Dominic Day and Guy Mercer also come into the pack. Owen Farrell this time calls for the tee - and this time Saracens will return from an attacking position with points. The hosts strike first at Allianz Park. Sarries are definitely having the better of the set-piece, twice turning over at the line-out through lively lock Maro Itoje and now, for a second time in the match, their pack gets a shove on at the scrum to win a penalty. The home fans are up in celebration as Ernst Joubert touches down, but Mike Ellery had placed a foot just into touch earlier in the move so it won't count. An otherwise relatively quiet opening nine minutes or so in north London. The visiting Exiles have started brightly at Allianz Park, kicking an early penalty to touch and getting a rolling maul moving towards the try-line. But eventually the ball is knocked on and Saracens will insert at scrum time. A Harlequins side including England skipper Chris Robshaw, of course. Full team news to follow shortly. Saracens fly-half Owen Farrell boots the ball long to get this afternoon's Premiership action under way. Sarries are in their traditional red and black, London Irish in white. So who's impressed you in the early stages of the Premiership season? Do unbeaten Saracens already look in pole position to reclaim their crown? Can Worcester survive at the top table? Get in touch with us throughout the afternoon by using #bbcrugby on Twitter. London Irish, who have lost their opening two games in the Premiership, bring in Scotland duo Sean Maitland and Blair Cowan. Fergus Mulchrone replaces Eoin Griffin at centre as director of rugby Tom Coventry makes three changes from the 38-11 defeat at Exeter last time out. Saracens make seven changes to the side which won narrowly at Gloucester in round two, with captain Alistair Hargreaves making his first start of the season. Rhys Gill, Maro Itoje, Will Fraser and Ernst Joubert all come into the pack while scrum-half Ben Spencer and centre Duncan Taylor return to the starting XV. England's Owen Farrell moves to fly-half. Replacements: Saunders, Barrington, Lamositele, Hamilton, Burger, Wigglesworth, Barritt, Wyles. Played two, won two meets played two, lost two at Allianz park this lunchtime. There's no let up for Tom Coventry's Exiles as they face the defending champions following defeats against Leicester and Exeter. But Irish can cling to the fact they are one of only three sides to beat Sarries here - a 22-13 victory back in February 2014. We have three matches to bring you from the English top flight this afternoon - and you can follow live text and radio commentary right on this very page. So, after six weeks and 47 matches, today we will at last find out who rules the world of rugby union. Everyone excited? Yep, us too.